Every new year, millions of people young and old make resolutions improve their lives and be happier. It turns out happiness isn’t just a lofty goal. Happiness has real benefits, especially for seniors. 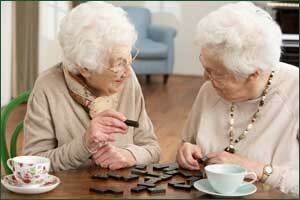 Happy seniors perform better cognitively and have better memory retention. A 2013 study at Ohio State University showed that seniors who had a temporary boost in mood performed better on tests of their decision-making skills and working memory. Happiness is also strongly tied to longevity. Research shows that happy people extend their lives by up to seven years, and that seniors are among the happiest age group overall in the U.S.
For seniors, socialization is one of the strongest predictors of happiness. Just a few hours of socialization per day increases well-being by over 20%. Seniors are more likely to enjoy and value activities that have meaning to them, respect their individuality, and connect them to others. Activities with friends and family and even regular phone calls can significantly improve their outlook. Conversely, seniors who feel isolated are more likely to report poor physical and mental health. In fact, isolation can actually accelerate cognitive decline. It’s a significant risk for seniors. They can become isolated due to the death of a spouse, age-related illness, or limited mobility – all times when they need social support most. Happiness Is A Skill You Can Learn At Any Age. That’s why so many seniors thrive in senior living residences. Independent living, senior living, and assisted living residences offer regular schedules of social activities, exercise classes, and spiritual programs to bring happiness, health and enjoyment. FountainView at College Road is a glatt kosher senior living community in Rockland County, NY.